Virtual Reality systems excel as training aids. The first simulations created were designed for training, and the same aspects that were true of them, are true of modern simulations. A virtual environment is ideal for conducting practical training on matters too dangerous, unethical, or costly to perform live, until the trainee has a very good grasp of what they are doing. When the training environment is virtual, you may not need the physical classroom, the physical instructor to be present on the day of training. You may not even need the students. Everyone can be in different locations. No classroom, instructor on one continent with the students on two others. All this and more, is very real. From teleconferencing, to virtual classrooms, interactive lessons, to virtual field trips, virtual reality offers the next stage, our next step. Classroom, 2.0. A detailed look at the uses of VR - notably Second Life, but the concept applies to any - to improve learning opportunities for teenagers. Mainstream news portal BBC news has picked up on the trend of using virtual environments to teach. They are only a handful of years late to notice this. Their podcast covers Second Life as if it was the only example, but still worthy of note as to the increasing use of VR in education. A surprising find from an old anime space opera released in 1999. The main plot and most of the episodes have nothing to do with VR, but this well-done representation of how a VR school is created for kids in remote locations - and why it is created this way, is a little gem that is well worth remembering as we strive to create these interfaces for real. Military forces around the world are, without exception, in favour of team contact sports. Football, rugby, American football, anything that throws players into melee, and also expects them to work together. Surely there is a way to impart the same skills, without physical contact, physical location, or even, the ability to physically move? Within the adult VR world Taurius is the Academy of Sign Learning allows two people to carry on a conversation in American Sign Language (ASL), across the internet, teaching those with good hearing, a language of those without. A light look at IBM's Virtual Forbidden City, educational VR world; in bitesize, digestible chunks. Using virtual gameworlds, in order to train the US intelligence service, is a surprising move for the US govt. What is less than surprising of course, is the evidence that it is working far better than classroom lectures ever did. Leaves is a world of natural wonders, wholly given over to the replication of nature, and the beauty of wild areas, online. A beautiful parkland, it is open top all, irrespective of location or ability. Using computer-mediated environments to educate is slowly being recognised as a major step forwards in education, mainly because of the rising attention, attendance, and knowledge levels associated with it. Essentially a collection of peer reviewed academic works, like all books of this type, Proceedings of the 6th annual conference on Intelligent Tutoring systems is a thousand page tome containing 93 full papers on the development of AI systems, narrative, motivation and emotional control for educational purposes, from 2002. Essentially a collection of peer reviewed academic works, like all books of this type, Proceedings of the 7th annual conference on Intelligent Tutoring systems is a nine hundred page tome containing 73 full papers. Essentially a collection of peer reviewed academic works, like all books of this type, Proceedings of the 8th annual conference on Intelligent Tutoring systems is an eight hundred page tome containing 67 full papers. Essentially a collection of peer reviewed academic works, like all books of this type, Proceedings of the 9th annual conference on Intelligent Tutoring systems is a thousand page tome containing 63 full papers. A collection of peer reviewed academic works, like all books of this type. Proceedings of the 8th annual conference on Intelligent Tutoring systems is an seven hundred page tome containing 61 full papers. Realistic Learning Environments Best for the Brain? At the time of writing, researchers funded by the Biotechnology and Biological Sciences Research Council (BBSRC), have just published results proving what was long suspected by common sense: past experience really does help when we have to make complex decisions based on uncertain or confusing information. Understanding Virtual Reality is essentially a holistic introductory book, covering in a little depth, a wide swathe of issues, applications and advancements in and around the sphere of virtual reality. Scientists have revealed the results of an October 2005 study stating that specialised interactive computer programs designed to train areas of the brain improved healthy youngsters' ability to pay attention. Very much an educator?s book, written with seasoned teaching and lecturing staff in mind, the tome approaches ludology and educational theory in equal doses, never compromising the integrity of each field, and slowly combining them into one discipline. Thus, it is also ideal for both game and simulation designers. Healthcare is key for our health and wellbeing. There is so much we could do, if only virtualised data was freely shareable, and if VR itself was properly used to visualise, and train, first. Pharmacist training has joined surgeon training, and midwifery, on the ranks of medical professionals to be trained on patient interaction and condition diagnosis via virtual reality. 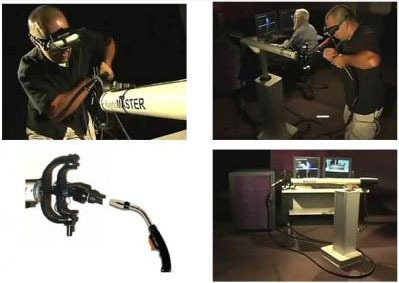 In a strange twist of logic, endoscopic surgeons are starting to benefit from the technologies used in flight simulators. The task at hand is the development of a surgical simulator for minimally invasive surgery, that uses the standard endoscopic tools the surgeons would use in an actual surgery, and will use VR technology to add in full sensation. Purdue University, in Indiana, US, decided to create a clean room to train students on vial procedures sterilizing implanted equipment. They could not build their own clean room, not and be able to keep it to the same standards of cleanliness. So, they created a virtual replica clean room. A study undertaken by researchers at the University of Texas Medical Branch at Galveston, has unearthed some rather startling data. It seems that standard PC and console gaming, may actually be a better tool for minimally invasive surgery, than the task-dedicated simulators currently used. The Virtual Dental Implant Training Simulation Program or VDITS is designed to help students in diagnostics, decision making and treatment protocols. However, its use is ultimately limited because VDITS is a fishbowl VR interface, not an immersive one - it expects participation via monitor screen, mouse and keyboard, rather than a full on virtual experience, at least at this stage. 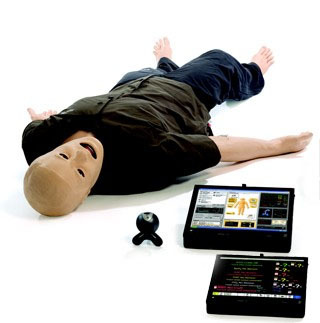 Laerdal Medical 's third generation patient simulator mannequin was designed to be as realistic as possible, given 2009 technology levels.The SimMan 3G can cry, bleed, convulse, go into cardiac arrest, and produce symptoms of a myriad of common medical ailments. The Classroom, that quaint, time-honoured symbol of group education. Is it really the pinnacle of the training process? The best we will ever have? As our world accelerates in pace, and continues to change irrevocably from the image of days gone by, is it time to consider other methods? As the physical form of an individual continues to matter less and less in other fields of endeavour, it may be time to consider other ways to educate. It may be time to consider retiring the classroom all together. This book is the culmination of several years of research by 28 different researchers, studying kids' use of the Internet, digital media and social networking sites. With interviews from more than 800 teens and thousands of hours observing behaviour of such, the book is an exposition of the new methods for learning, that are not only driven by technology but adopted by youths outside of the control of slightly sluggish schools. Bill Thompson, BBC reporter, examines the trend of teaching children via VR. Kansas, one of the backwater states of the United States is not exactly renowned for it's technological prowess. Yet, even here, the benefits of virtual schooling - as in full on virtual school - have not gone unnoticed. A detailed look at the haptics and total immersion based VR welding simulator. Brainchild of both SGI and VRSim, this training device uses VR to train to a higher degree fster, than the physical world does. It also does without special ventillation and useless metal offcuts. The turn-key Virtual Reality Welding Trainer system, brainchild of both SGI and VRSim demonstrates the possibilities for VR in any training situation. This slideshow-style resource, explores just how much it has to offer. There is frequently a deficit of attention paid to the subject matter at hand, by students and trainees alike who feel under stimulated by either the subject matter, or the method of delivery. In order to provide a worthwhile,. Value for money training session, ways of overcoming this lethargy need to be utilised. Gaming Lives explores the complexly rendered relationship between computer gaming environments and literacy development by focusing on in-depth case studies of computer gamers in the United States at the beginning of the twenty-first century. This volume examines the claim that computer games can provide better literacy and learning environments than U.S. schools. One of the greatest advantages these forms of training can offer, is your instructors and learners don�t even have to be on the same continent, let alone the same room. Yet, they still enjoy all the benefits of classroom study, and none of the limitations. A BBC article examining the phenomenon of online-only courses,and investigates how it is possible to clamp down on cheating in such courses (getting your papers from elsewhere, cheating in exams) within the limits of the law. An interesting transformation has quietly been taking place, with education available for all. Google's YouTube service has been partnering for the last few years, with as many schools, colleges and universities as it can get to agree to record lectures, classroom sessions, guest speakers, even entire course content. Whether for military intent, or policing of difficult situations, facing up to an emotionally charged, adrenaline rushing situation in VR before facing it physically, prepares the trainee and saves lives. This is the sort of thing poured over by those with purse strings. Is a given media type really providing effective training for every unit of currency spent? Is it comparing favourably to other methods? If its not, or there is no data, money will not be spent. It seems that there is a silver lining to the rocketing price of crude oil and its derivative products. With car fuel prices soaring, they are becoming beyond the means for students to afford. What happens when students cannot afford to drive, but live off-campus? They bring campus to them, instead.